This weekend, if everything goes as “planned,” a universally shared phenomenon will appear in all its colorful glory above the five-story Bemis Center for Contemporary Arts, twice a day for 20 minutes each, until Sept. 12, 2012. Man-made, but no less poetic in their creation or appreciation, these rainbows will appear because of a complex collaboration of artistry, science, industry and the elements, aided and abetted by Bemis and its staff. The Rainbow: Certain Principles of Light and Shapes between Forms is the site-specific, commissioned project of installation artist Michael Jones McKean, a former Bemis artist-in-residence in 2003. McKean is an internationally known artist who is currently an associate professor of sculpture and media at Virginia Commonwealth University. Recognized for his operatic, epic sculptural installations, including the intriguing and challenging The Zephyr Breeze in the Deepest Ocean Valley at Bemis in 2005, The Rainbow is his largest project to date. McKean and Bemis Chief Curator Hesse McGraw began working on The Rainbow in 2008. Since then a series of successful tests and a highly innovative process forecast the project’s opening this weekend, which includes a public tour Friday from 6-7 p.m., a panel discussion, Saturday from 5-6 p.m. and a reception, 6-9 p.m. But the The Rainbow will climax, weather permitting, when pressurized gray water—captured, filtered and stored in six, 10,500 gallon water tanks—will jet from nine nozzles atop Bemis’ roof and recreate what virtually everyone knows to be: any display of the colors of the spectrum as it arcs through the sky, caused when the sun shines on droplets of moisture in the atmosphere. But you don’t need a weatherman to know that this unique event, which will, hopefully, repeat daily for the next 15 weeks, will be yet another example of why the Bemis is such a leader in contributing to the area’s contemporary art vibe as part of its mission, this time in the public art arena. Both Masuoka and McGraw believe that highly experimental artwork of this sort will have long-term benefits, not only for Bemis but for the artist and the community as well. It has been a rewarding dialogue for Bemis for the past decade but a challenging one, Masuoka says, because “the issue is that most people have a preconceived idea of what (contemporary art) is or what it should represent. The Rainbow will challenge those preconceptions but also help redefine for many, not what art should be but what it can be. Those patrons who have asked “Why?” after attending test runs and during the install the past year or so have been very “positive,” according to McKean and McGraw who strongly favor Bemis’ open door policy to an artist’s process. One group that definitely “gets it,” Masuoka and McGraw said, is the long list of in-kind sponsors who supported about two thirds of what it required to get The Rainbow to this weekend’s lift-off. A short list of these supporters includes lead sponsor Lindsay Corporation, Snyder Industries, Rybin Plumbing & Heating, Davis Erection and Crane Rental and Rigging, Mobile Roadie, Watertronics and Dr. Joseph Zehnder, chair of the department of atmospheric sciences at Creighton University. Typical of the hands-on support, skill and enthusiasm brought to The Rainbow is plumbing specialist Jay Rybin. Rybin dealt with possible code issues and an innovative piping design that connected equipment tanks, pumps and filters all the while living on site and working evenings to cope with the unexpected. 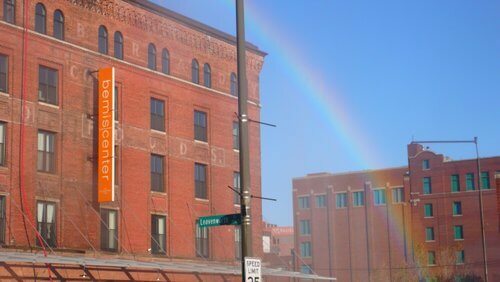 One individual who anticipates the inaugural of The Rainbow with similar insight is installation artist and sculptor Catherine Ferguson, whose site-specific work has also been shown at Bemis and whose public art is featured in the Omaha area. Whatever drives McKean, McGraw says it results in work of “uncanny scale” including among other facets, “condensed moments of universal phenomena…that stretch to encompass the fullness of meaning and human sentiment.” A recent conversation with artist and curator explains the former’s connection to a rainbow at both the creative and human level.